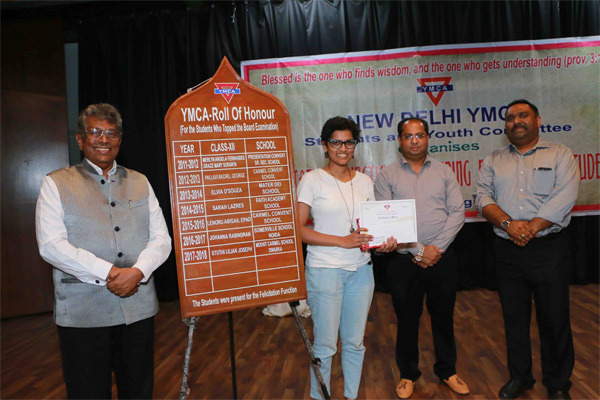 YMCA's Department of Social and Human Development is the social service wing of New Delhi YMCA. Here we strive to achieve a JUST SOCIETY where oppression, exploitation and denial of life is confronted and transformed. And we do this by working for the underprivileged sections of the society through 5 Community Development Centres and 29 alternative learning centres, one family counseling centres and 84 Self - Help Groups. Social and Economic Empowerment through Awareness Generation Progarammes and Family Redressal. We believe that a self-reliant society can only be developed by educating and motivating the poor in resettlement colonies and slums by concentrating on child care, community health care, education, vocational and skill development activities as well as women empowerment programmes. We function with the vision to “create opportunities to enable the members of the communities, to lead a life of dignity and live to its fullest potentials.” And our focus is on the underprivileged and the urban-poor living in slum clusters and resettlement colonies. YMCA’s Department of Social and Human Development in constantly engaged in programmes and activities being organized in the areas of education, vocational, health, empowerment, Family Counseling, Skill Training, Developing of Self Help Group, Awareness Generation Programmes, Competitions, Training Programmes, Youth Group Activities, Networking Meetings, Important Day Celebration and Events. The sole purpose is to empower the weaker sections of the society through the light of education and self-reliance. Have you ever asked where does your baby-sitter keep her child when she comes to work at your house? Exactly, that’s what we do. We provide substitute parental care and healthy atmosphere for proper development of children of working mother who are below the poverty line to earn their livelihood. Children below the age of three years are accepted in this programme, which is generally designed to help the working parents particularly those employed in the unorganized sector as well as living in slums. We not only take act as substitute to the parents but also provide guidance towards child’s health to the parents from time to time. All Community Development Centres run Balwadi for the children for their holistic development which includes Social, Physical, Psychological and emotional development. And while doing this we monitor the mental growth of the child by charting it out from time to time. When you come home from office, you help your child with the home work or a tutor does that? Ever thought how your maid, your driver does it, considering the level of their education? That's what we help do. We provide the same help thereby sustaining the interest of their children in studies and decrease dropout rate. To enhance skills and confidence of youth and encourage to become self-dependent, we provide vocational training through Computer classes, Cutting & Tailoring and Beauty Culture to literate and semi-literate adolescent girls. We also have collaborations with other NGOs to impart training which will further enhance their skills for a better future. Informal education through Nukkad Natak, Rallies, Skits, Meetings, Movies and Educational Exposure Visit on the different issues like Life Skills, Food & Nutrition, Health & Hygiene and Legal Rights & Advocacy, etc are always a better idea of merely education the youth via books. So we keep organizing these from time to time. The Department runs Family Counselling Centre at CDC Sunlight Colony, is partly supported by the Central Social Welfare Board. It provides preventive, curative, referral and rehabilitative services to victim of atrocities. Be it dowry demand, domestic violence, marital maladjustment, harassment, cruelty amid family members or any other family dispute - our counselling experts ensure that the best efforts are taken to guide the couple/family to stay happy together. And if not, then how to go about the court proceedings for a peaceful legal separation. The Department successfully runs 84 Self Help Groups at five Community Development Centres. Education and awareness are the path to decision making power, self-confidence and upliftment of the social status. And that’s what are self-help groups aim at. Not only this, women attached with these groups also learn the art of saving as well take a loan as per the need to expand their small-scale ventures. The Community Development Centre Savda-Ghevra explored the possibility of converting the Self Help Group into a Micro Credit Entrepreneurship. The CDC Savda Ghevra is running a kitchen-masala production group with the women of the Self Help Group since 1st January 2014. Named the “Shudh Masala Group” its members are successfully supplying masalas to the local community and also to YMCA. And the women engaged in its production are roday basking in the glory of self-reliance.